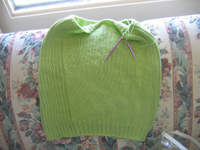 Here is the finished Fisherman Shrug. The happy ending to yesterday's rant is that this shrug was a perfect fit for my friend Leslie who is eagerly awaiting the arrival of her third child at any moment. I'm so glad! It's the perfect thing for sitting up at 2am nursing a baby. And just for the heck of it, here is the progress made on Samus. 140 stitches is a very long row. 'nuff said. Since he got a haircut, Pippin is on the lookout for anything wooly to cuddle into. Finally, here is my other long term UFO, the Lime Ribby Shell in Butterfly 10. I'm going to actually put some effort into finishing this one sooner rather than much later now. Spring might be here and I'm more likely to wear it than Samus in the near future. I am nearly up to the arm divisions. Not bad really for only knitting on it during the monthly staff meeting. That's it for now. Have a fabulous weekend! First, I like knitting magazines. I can usually see something to make me laugh, something I might one day want to make, something to learn. I look forward to them. I have also moved on from the poncho thing and into the shrug thing. That's when I saw the Spring 2006 issue of Knit It! Magazine, published by Better Homes and Gardens and with Lion Brand yarns all over it. On the cover is a nice, plain, easy, fast to knit shrug. Sure, it calls for Lion Brand Jiffy Thick and Quick, but springtime in Calgary can easily call for a super bulky shrug. Cheap, Washable, easy to find yarn and a super easy quick knit on big needles. Just the thing to combat the blahs from Samus. (Miles of red stocking stitch!) I joyfully plunked down my money for the magazine and the Lion Brand yarn and cast on the back. I'm not tiny, but the sizing looked good for me. I pretty much knit to guage so I didn't swatch (more on that in a minute), and I cranked out the back in one sitting. Sleeves followed within the week. I knit the fronts while chatting online. Then, I sat down to mattress stitch the raglans and discovered that THEY DO NOT FIT. NOT EVEN CLOSE. Not only that, the steam blocked shape of my sleeves does not match the shape on the schematic. How can that be? I followed the directions, I used the recommended yarn. I don't think these directions can make that shape but damned if I know which one is right. More annoyance followed when I went to Lion Brand and found the shrug - that I had bought a whole magazine for - is a free pattern online! Not only that but they have rewritten the instructions for the raglan shaping entirely (but changed nothing in the arm shaping). Grrrrrr! I ripped out the sleeve caps and reknit them according to the new directions. This time they fit the back. 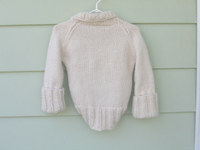 (There's just that niggling little thought that there is more wrong with the arms that the raglan shaping.) I picked up a bajillion stitches around the circumference and knit the band - no problem there. Oh happy day - shrug finished - a few bumps - but it looks okay! Yeah, right. Looks are deceiving and due more to my obsessive making up techniques than to reality. My arms look like wool wrapped sausages in those sleeves. They are definitely too small. The schematic is right. The directions are wrong. So, I wrote to Lion Brand. Not our fault, they say, BHG is supposed to check out the patterns not us. I still haven't heard from BHG - and frankly don't expect to. I must be alone in thinking that a magazine aimed at beginning knitters would make sure that the COVER PATTERN was right. Obviously, I won't be buying Knit It! again. Not only that, I'm very cautious about any pattern which recommends Lion Brand yarn. If you simply must make this shrug, go read High Energy Knits. Jenny has done the math that Lion Brand and Better Homes and Gardens should have done. If you knit the sleeves the way she says, you should be ok. I didn't find it until after my shrug was done and I'm so disgusted that I'm just giving the damn thing away to a friend with super skinny arms. I'm going to go soothe myself now with a sock. mmmmmmmmerino! It took 4 tries to get the heel to an acceptable level. By then I had some strange numbers. I have no idea where those extra few stitches came from and I didn't actually care that much. I figured the socks are for me and they're going to be comfortable if I make a few gusset type rows and no one will know. Except you. But that's only because I told you I did it. Click on the thumbnail to inspect my work. What is that gorgeous yarn? It's Lorna's Laces Shepherd Sport in the colourway "Gold Hill"
What pattern did you use? I didn't. I used the "Turkish Cast-On" then hints gleaned from many webplaces. No really, what's the pattern? Cast on 24 stitches using the Turkish Cast-on or Figure-8 Cast-on. Increase 1 stitch at each end of both double pointed needles until you reach 56 stitches. Redistribute stitches onto 3 dpns for knitting in the round and knit happily away until you think it's long enough for your foot. Then make a short row heel. (Screw up the wraps and rip it out.) Make another short row heel using the yarn over method instead of wraps. (Growl at the vision of massive holes in every row and rip it out.) Make another short row heel using the wrapped stitches again. (Forget that you have to pick up TWO wraps, hate the resulting appearance and, you guessed it, RIP IT OUT). Banish the sock to the bottom of the sock bag and knit on a different sock just to teach it a lesson. Inform the sock that if it does not choose to cooperate by making a reasonably neat short row heel this time, it will be given a heel flap! Do the effing wrapped short rows again, but this time make sure your tension is even and the wraps are firm. Pick up BOTH wraps carefully and forget about that whole purl through the back of 3 loops bit. Count your stitches and discover 30 on the top of foot needle and 35 on the heel needle. Swear at the sock. Use some judiciously placed k2tog and skp until you are back to 56 stitches. Knit about 5 rounds of stocking stitch after the heel. Knit 5 rounds of K1 P1. Transfer the whole sock to a piece of scrap yarn to hold the loops while you knit the other sock. My brilliant plan is to knit the other sock to this point then share the remaining yarn between them at the cuff. I'm not going to break the yarn preferring to annoy myself with the inevitable tangles rather than having to make a joint in the cuff. 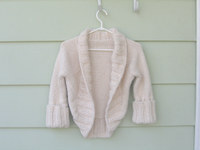 In other news, here's my order from Handknitting.com. 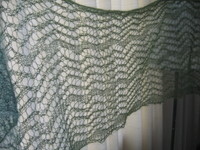 Three skeins of KidLin Pixie in the colour "Grasshopper" This is laceweight kid mohair and linen blended together. The colour is a gorgeous blend of different greens - bright yellow-greens, chartreuse, lime, a few mid tones, and some lovely shaded blue greens for depth. This will be Kiri, unless I change my mind. But it will be a lace shawl. The sock yarn is Austerman Step. Go check this out. It has aloe vera in the yarn! The aloe is supposed to last 40 machine washings. Dry flat, no fabric softener. I chose the colourway "Grass". Any ideas what's on my mind? So I'm sitting at work, supposed to be working on documents and assessments and getting ready for parent teacher interviews. What am I really doing? Surfing the net and knitting a sock. 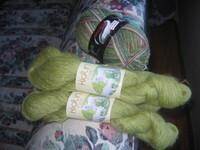 I had 1 skein of Lorna's Laces Shepherd Sock left that I bought on ebay a while ago. The first skein became Branching Out. I don't think there's enough for a pair of regular socks in just one skein so I decided to try a toe up pattern. 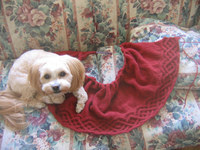 I found a tutorial in an old Interweave Knits magazine (Fall '05, Meg Swanson) about a Turkish Cast-on. The article shows 2 circulars. Then I found this fabulous tutorial online. I knit on dpns, so I used them instead. No big deal. About 15 tries later I had 14 stitches on each of 2 parallel dpns. In between was several hours of internet searching trying to figure out how many toe stitches to start with and how to do the increases. Eventually I gleaned enough to feel confident that if I cast on the same number I usually finish with that I should be fine. Smart huh! 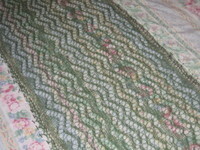 After the Turkish Cast-on, I worked one row straight, then the next was K1, M1, K to last stitch, M1, K1 on each needle. Then a row plain, then an increase row, and so on until I had 56 stitches. I meant to stop at 52, but did an extra increase round without counting and did not want to undo it. (In more clarified Knittish, increase one stitch at each end of both needles every other row) Now, I'm on the foot. Zipping along in stocking stitch on 3 needles. 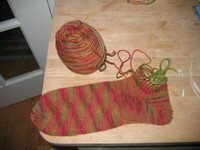 When I get to the heel I'm going to do a short row heel. Yes, more 'net searching. After the heel, 3 rounds of stocking stitch then 5 rounds of ribbing. Here's the tricky part. I'm not going to cast off. I'm going to cast on sock 2 and do the same thing. I'll see how far the yarn will go - longer cuff or, gulp, shorter. Step back a bit to those M1s. There are several ways to increase by one stitch. I use what I have since found called a "Lift 1". Essentially, I knit one into the loop below the stitch. That's a "Lift 1 Before". I use it because this style of increase does not leave a bar showing in the stocking stitch. The row goes K1, Knit 1 into the loop below, knit 1 into the actual stitch on the row and continue knitting to one stitch before the end. Why? Because I only want 1 stitch on the other side of my increase. At the end I again knit 1 into the loop below then knit the last stitch. This made for nice toes but there is a slight difference in appearance. I found a fix. (Any guesses where?) Rather than knitting 1 into the loop below on the last stitch, I need to knit 1 into the loop below the next to last stitch AFTER I knit the stitch (a Lift 1 After). So, knit to the last stitch before the end, then insert the tip of the LEFT needle backwards into the loop below the stitch just made (sort of like you do when you SSK) and knit that, then finish the last stitch. Still with me? Sure you are. Would you like pics? I didn't take any of sock 1, but I will for sock 2. Give that Turkish Cast-On a try - it's not that hard and very cool! Click on images for full screen size. Blocking. Note my clever use of the stripes on the sheet to keep the edges straight. Also note my not so clever failure to measure. No clue what the dimensions are. Closer shot so that you can see the waves. Based on the Rowan Magazine picture, I had NO IDEA what the lace was supposed to look like. I hope this is it. Closer, post blocking view of the end. I like the double eyelets and the organic way the garter stitch flows into the pattern. 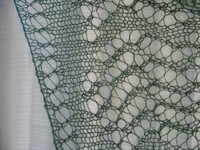 A final post blocking lace in silhouette view. Yarn - Madil "Kid Seta" in colour 470, about 1 1/2 balls. Finished size - approximately 18" x 58"